Originally established in the early 1900s as a cluster of six rental cottages in this turn-of-the-century resort town, White Horse Lodging now owns and operates three of the six cottages. The cottages at White Horse Lodging are named Buffalo Gal, Flute Player, and White Horse Lodge, the premier cottage. Travel to Medicine Park, dubbed one of "America's Coolest Small Towns" by Budget Travel and book a cottage at White Horse Lodging for unique cobblestone accommodations within close proximity to the Wichita Mountains Wildlife Refuge. Built in the style of early resort or summer cabins, the White Horse Lodging cottages are famous for their screened-in porches and rounded granite cobblestones. The restored cottages now feature modern amenities while still retaining the simple appeal of a bygone era. The cottages are located just across the street on the west side of Medicine Creek near the original foot bridge and are beautifully decorated in Native American and Old West Style. White Horse Lodge, the largest cottage of the grouping, can accommodate up to eight guests. Guests will enjoy a screened-in porch, as well as a fully equipped kitchen complete with a full-size range, oven, refrigerator and microwave. A double bed is located downstairs, while two twin beds and a king-size bed are located in separate upstairs lofts. Stretch out on the comfortable queen-size sofa bed downstairs in the sunroom, or enjoy the peaceful serenity of the cottage's bath with antique claw-foot tub. White Horse Lodge also features a flat-screen television with cable, DVD player, wireless high-speed Internet access, and a barbecue grill and patio. The Buffalo Gal cottage, decorated in charming decor that celebrates the cowgirls of the Old West, features a queen-size bed, day bed with pop-up trundle and a loft accessible by ladder with a second queen-size bed. Other amenities include a screened-in porch, fully equipped kitchen, spacious bathroom with claw-foot tub, wireless high-speed Internet access, cable television, DVD player and a barbecue grill. 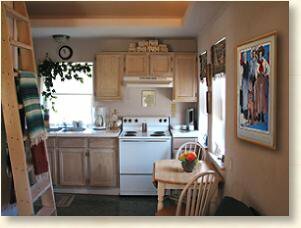 The Buffalo Gal cottage can accommodate up to six guests. The Flute Player cottage also features a screened-in porch and can accommodate up to six guests. A queen-size bed and pop-up trundle are located downstairs, while a second queen-size bed is located in the upstairs loft and is accessible by ladder. This cottage is decorated with Native American art and also features a unique collection of antique radios on a high ledge. Other amenities include a fully equipped kitchen, cable television, DVD player, wireless high speed Internet access, a spacious bathroom with claw-foot tub and shower, and a barbecue grill. Nearby activities include swimming in Bath Lake, picnicking, fishing, bird watching and wildlife photography. Take an easy stroll to Medicine Park's quaint shops and restaurants or hike along the trail that surrounds the creek. Feed the ducks and geese, or watch the fish jumping and the turtles sunning themselves alongside Medicine Creek. The nearby Wichita Mountains Wildlife Refuge attracts free-roaming American bison, elk and Texas longhorns, and is also known for hiking and rock climbing. From I-44, take Exit 49 (Medicine Park/Carnegie) west. Go west approximately 6 miles to downtown Medicine Park. Cross bridge across creek to W Lake Dr.